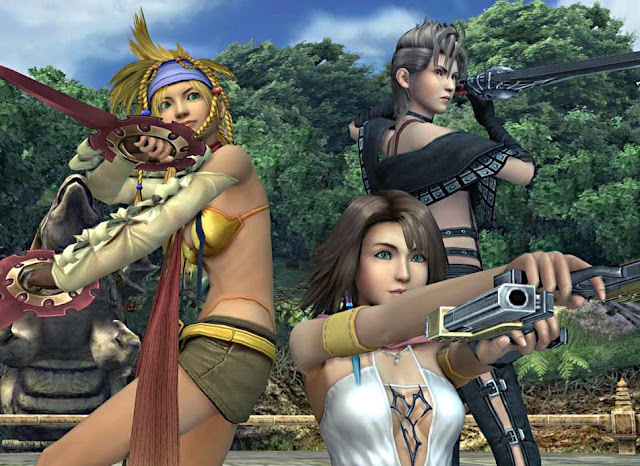 Related reading: More on Final Fantasy X-2 - is it more than a pretty face? Most significantly of all is that it is far more fanservicey. In fact, it's the first Final Fantasy that features genuine, bona fide fan service. With the PlayStation 2 (Final Fantasy X-2's first release), Square Enix finally had enough power at its hands that proper fanservice was a development possibility, and I've long held the theory that Final Fantasy X-2 was an experiment to see just how far they could push that with fans. We're not talking about anything as extensive as titles like Dead or Alive, of course, but with an all-girl team of heroes, and a gameplay mechanic that would let characters change clothing mid-battle to also change their abilities, Square Enix decided to spin this "dressphere" job system to some rather skimpy ends at times. Naturally I loved it. I love the game as it is anyway, but the fun and lighthearted sexiness to it also added to the experience, and helped the game stand out against the more dour and serious tones of most Final Fantasy titles. And so, to celebrate this week's release of Final Fantasy X-2 on the Switch, I figured that I'd run through the various dresspheres that you can play dress up with in the game. If this does happen to be your first time playing Final Fantasy X-2, then lucky you (I wish I could play the game for the first time)! To help you out with your first play, each of the image cards below features some basic information about the dressphere and its role within the game. While Final Fantasy X-2 is a light hearted and fanservicey title, it's also one that has the series' typical complexity around job roles, and there are a lot of jobs to choose between so you'll find yourself constantly tweaking your party as you play. Luckily, the game outright encourages you to be highly flexible with the character roles, so you'll find yourself constantly switching them around, which makes for some dynamic gameplay indeed. Naturally, the white mage dressphere will get heavy use throughout your play - it's almost impossible to get through any Final Fantasy without curative magic. The other two roles are far less essential, but a lot of fun to mess around with. I know I generally find myself leaving Paine in her Beserker costume a lot of the time every time I play Final Fantasy X-2. The high damage output and speed more than make up for the glass cannon-like resilience of that role. While Lulu doesn't return from Final Fantasy X as a playable character, the black mage role lives on, and now you can give any of your characters that job. I rather like giving it to Rikku, who looks rather fetching in her tight little miniskirt. The other two roles I've never found to be essential through Final Fantasy X-2. Dark Knights are powerful, but I've never relied on abilities like Bio and Death while playing a Final Fantasy game, and the fact that they keep losing health as they fight makes them a pain to micromanage. Meanwhile, the Festivalist is a purely fun dressphere. It is fun seeing the girls in traditional Japanese festival garb though. "Gunner" is Yuna's default role in Final Fantasy X-2, and it's one that remains quite useful through the entire game. One of the major abilities is a bit button mash-heavy, though. Gun Mages are useful against specific enemies, but I always found them something of a B-tier class that never did much to encourage me to play with them. Finally, the Lady Luck dressphere does a spectacular job of showing off the legs and midriffs of each girl, but it doesn't pay off nearly enough to justify the randomness that it throws into the equation. There's nothing more excellent than getting Rikku into a pleat skirt... putting that aside, the Psychic is a challenging, but useful dressphere to use. Of the three jobs above, though, the one that will appeal to most players is the Samurai class; that dressphere really is versatile and useful in combat, thanks to its ability to both weaken enemies, and dish out significant damage itself. The mascot dressphere is mostly a joke, but the blue mage-like abilities to learn and use skills from other jobs makes it more useful than initial appearances suggest. The Warrior dressphere is a stock standard one that you'll use throughout the adventure, being surprisingly useful even as you unlock other melee classes. The other three dresspheres above are largely support in nature. The Thief is as useful in Final Fantasy X-2 as it is in any other Final Fantasy (i.e. marginally, until the enemy no longer has items to steal). The Songstress is a particularly powerful character however, because the buffs that it provides are particularly significant. It makes sense that it would be a dressphere that Square Enix wants you to use a lot, since the game itself is, in part, about idol culture. Finally, each character has an "ultimate" form, in which the other two girls disappear off the battlefield, and instead, the one remaining character gains access to a weapon of immense power. Impressively, Square Enix has designed the game so that these three forms are not so overwhelming in power that they replace the need for standard dresspheres, but at the same time, you'll want to use them strategically in battle, particularly against the boss characters. Of all the above, my favourite costumes are the Festivalists - what about you? And what's your standard mix of dresspheres (assuming you've played FFX-2 in the past). Be sure to let us know in the comments!